Contigo Byron travel tumbler that is 16 oz. 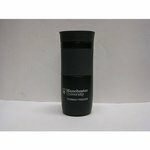 deluxe double wall, vacuum insulated, stainless steel travel tumbler. Has Manchester Univeristy Pharmacy Program logo on it.